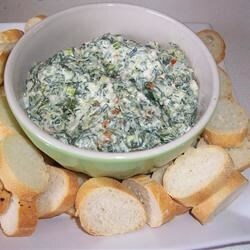 After Bible studies when a light snack is needed one easy dish that we do often is bread and spinach dip. It's fairly easy and people like it. You can buy premade spinach dip from Safeway or Costco or you can make your own! Thaw the spinach by taking it out of the package and soaking it in hot water in a bowl. While spinach thaws, mix the Knorr vegetable soup mix and sour cream together. Then strain spinach with a strainer. Press down on it with your hands so that you get as much of the water out as you can. The spinach should be pretty dry. Mix into the sour cream mixture. You may want to allow it to chill it in the fridge before serving. You can make it thursday night and have it waiting in the fridge for friday post-Bible study activity. One variation I like is to substitute the vegetable mix packets with (1.8 ounce) packages dry leek soup mix and/or onion soup mix. I just like the flavor of these and think it's better than the vegetable mix, but that's just personal preference. If you want, you can also chop up a few cloves of fresh garlic and mix it in. For a healthier alternative, you can use light sour cream and it will still give good results. [Possible side dish] Serve with sliced baguettes, french bread, crackers...etc. I would estimate 5 people per pound of bread if it is a light snack. More if people are hungry.